Golden conifer, great for screening and feature planting, suited to pots too! Tolerates frost, salt soil & prefers full sun. 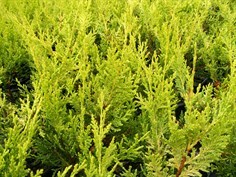 Formal or informal hedging, or specimen plant in garden.